Man! Cabin fever was really starting to set in, a trip to Nebraska for their opening weekend of turkey season was the perfect prescription. We went out and hunted with my cousin, Chad. This was an exceptionally good opener as the weather was extremely nice and the large winter flocks are already starting to really break up. The season opened on Sunday. On Saturday the local range was having a 3D shoot, no better way to warm up for turkey season than hitting the range! We had a great time, and the weather was almost too nice. Ashley has pretty solid form for a newer shooter! We have hunted this place quite a bit so we were familiar with how the turkeys moved about this property and where their main roosts were. We came up with a plan that we thought would be solid. The first morning of the hunt I sat in the blind with my Dad while Danny and his girlfriend Ashley went a few hundred yards down the field in the opposite direction. There were extremely large flocks roosting at both ends of the field, as well as large flocks in adjacent properties. They all usually converge in this corn field to do their morning feeding before heading up in the open hills to spend their days. 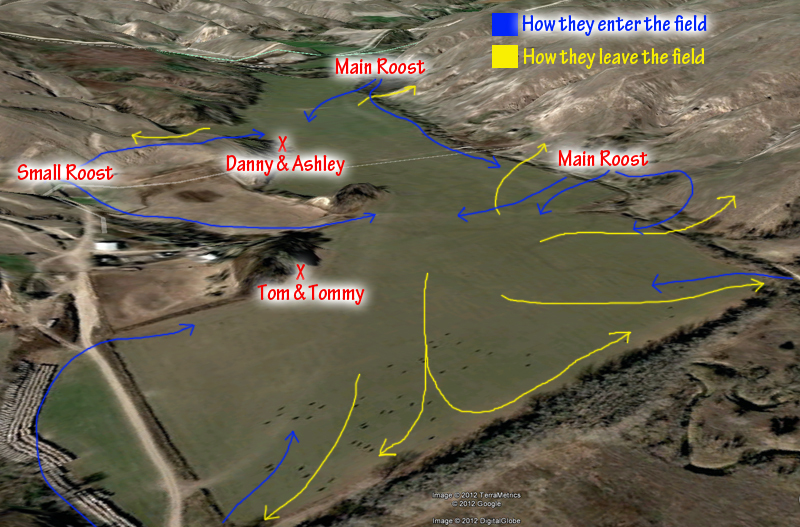 Here's a look at our general plan and how we set up on opening morning. As you can see, we did not want to set up too close to the roost. These birds are in their gigantic winter flocks at the moment, but they utilize these roosts throughout the year. We wanted to hunt them a few days in a row, so we tried to coax some in after fly-down, and once they left the field we went and hunted somewhere else until the following morning. The vocalization was intense, the first three hours of the day was non-stop hen talk. The toms and jakes were yackin' it up as well. Before they flew down the gobbling sounded like a constant thunderstorm. 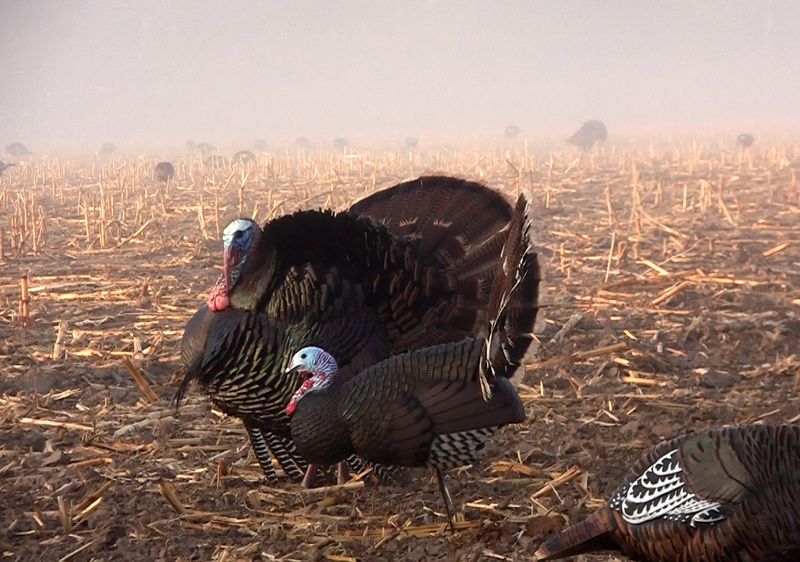 Once they hit the ground the gobbling slowed down more and more as the morning went on. After a few hours of being on the ground they all but quit gobbling. The toms were not really that callable. They were perfectly content to stick close to the hens spitting and drumming their hearts out. As we have done in the past, we called a lot hoping to bring the hens our way. Our plans worked out well. After an hour or so of observing the turkeys they finally made their way to our end of the field. Once some of the hens got close we picked up our calling tempo which brought them to within feet of our decoys. Naturally, some jakes and toms followed them over. I am not picky on shooting turkeys, jake or tom it does not matter one bit to me. With a few jakes at 15 yards and a nice tom at 20 yards, I shot at the jakes. I think I had a pebble in my shoe which was greatly distracting me ;) so my first shot went high/left by a few inches. The jakes all ran out a few yards further and were now standing next to the tom, 20 yards away. I quickly grabbed another arrow and put it on the string. This time I took aim at the tom sitting there strutting. I usually aim straight up from the legs, at about beard height. My arrow hit him a little behind the legs. The turkey gimped out 75 yards or so with blood absolutely pooring out of him. He bedded down and died a very short time later. I was shooting my Rampart longbow and a Sasquatch broadhead. I'm a big fan of the largest broadhead I can find for turkeys. I think that it paid off on this tom with my "less than ideal" shot placement. A big ol' Sasquatch broadhead. I am sure happy I had this wide broadhead on the end of my arrow, it did its job. I love when the guys are waiting at the truck, and I round the corner with a bird on my shoulder! :) I love it just as much when I can see another bird on the ground at the truck. The camaraderie is one of the best parts about hunting! A few hundred yards down the field Ashley was getting quite the introduction to turkey hunting. Ashley played DI softball at Purdue University, and she is one tough gal. Danny was just four days out of shoulder surgery, so Ashley was the one who had to carry in the pack with two chairs and the blind. Wave after wave of turkeys came past the corner of the field where they set their blind. Turkeys can be such easy targets to miss. On Ashley's first shot her arrow sailed harmlessly over the turkeys back. A little while later another jake came by, this time she got some feathers. She was stepping it in. The third jake that came by didn't have a prayer. The third shot was so perfect that the turkey didn't even run 3 yards, it died on the spot. This was Ashley's first successful bowhunt, or any hunt for that matter. She has been practicing like crazy, and is quite the shot by now. Once she got her nerves under control the turkeys had no chance! Ashley was shooting a Rampart recurve and a big ol' Magnus 4 blade broadhead. She got her first bow late last winter and has become a great shot in the past few months. I was so glad I got to be there on Ashley's first turkey hunt. I only wish I could have been in the blind with her and Danny. The following morning it was my Dad's turn to shoot. We set up in the same field directly opposite of where we were the first morning. 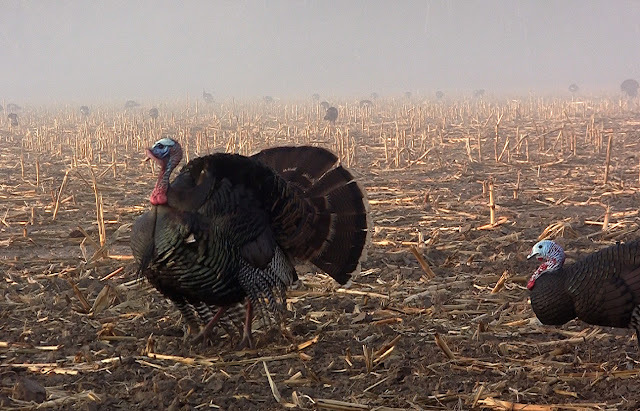 There was some thick fog that allowed us to cross the field, completely confident in doing so without spooking any roosted turkeys. The second morning we only saw about half of the birds that we saw the first morning. The turkeys took their time flying down from the roost. I am not sure but I think that the thick fog may have had something to do with it. They also took their time making their way in to our field, but they eventually did. One of the first groups of hens to enter our field had about five toms with them. Two of the toms broke from the group and charged in at our decoys. I had out a Primos Jake-Mobile decoy. 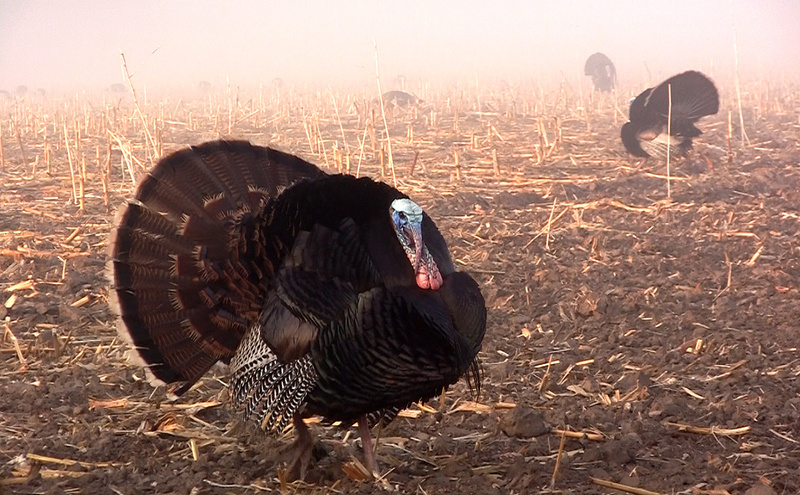 The first big tom ran up to it and postured a bit, as if he was going to get to spurring the decoy. I was about to freak out because Dad was taking his sweet time picking an opportunity to shoot him. 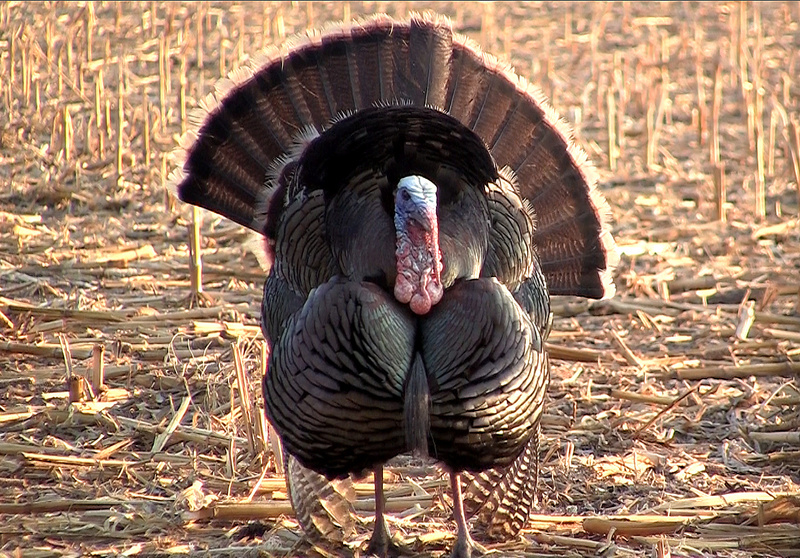 I had the video camera running and the turkey wasn't far from leaving the video screen. I hate when somebody urges me to shoot, so I generally try not to do that to others, but my nerves got the best of me as I told my Dad three times to "SHOOT!" Well he finally shot. We have had a lot of discussions about where to shoot turkeys, and heck, my Dad even wrote an article about it for this blog a year ago. But when you're in the moment sometimes it can be easy to forget to really pick that spot. Dad hit this turkey exactly where he was aiming, problem was, he aimed too far forward and shot the turkey right through the breast. When they are in full strut it can be very deceiving where their body is. You can see where Dad hit this turkey. His shot was far too forward. He should have aimed straight above the turkey's legs. I was convinced that he missed and only shot through feathers, but Dad insisted that he hit him. The turkey ran away and joined the main group out in the middle of the field. Around 20 minutes later we noticed one turkey had separated itself from the main group and was just standing there, not looking around, not pecking the ground, just kind of standing there. I started to think that maybe Dad was right, maybe he did hit that tom. Through our binos we kept an eye on that bird. Not too long later and he went up this small hill and bedded down. That was a good sign, and for the first time after the shot I got excited that Dad got him. The hill across the field where the bird bedded down. Zommed in and you can see him better. After the turkeys left the field Dad circled wide of that hill and came up the back side. I went towards the turkey, which hobbled to the top of the hill. Dad was waiting there for him with a Simmons tipped arrow. Here's Dad punching his tag. The old man was right...again. He sure did hit that turkey, but it goes to show how important shot placement can be for turkeys. Had the main flock not been in an open field it would have been easy for this tom to find a better hiding spot, where recovering him would have been much more difficult. Dad was shooting his Hawk recurve. He shot this turkey with a Sasquatch broadhead and finished him off with a Simmons Shark. Another testament for big broadheads on less than ideal shots on turkeys. Dad and I with his tom. We are headed back to Nebraska next weekend to hunt again. On April 2nd I turn 30 years old. My wife loves to remind me of it too. 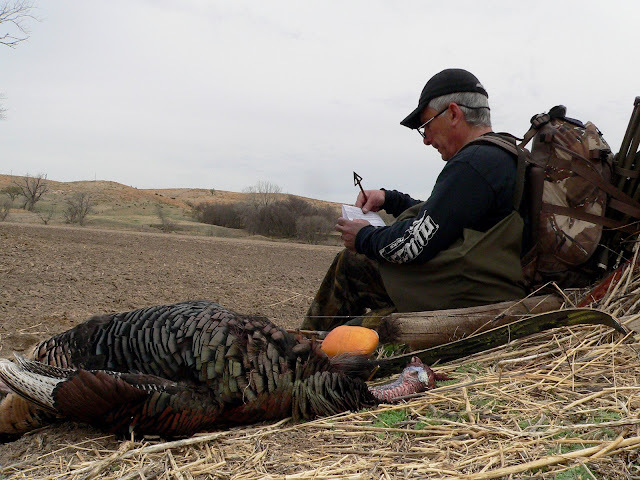 On my 10th birthday my Dad and I were hunkered under a cedar tree where he shot a turkey with his Bighorn recurve - my first turkey hunt and one heck of a birthday present! Since then that recurve has made its way to several owners in several states, and then by pure happenstance it is now back in my hands. I'll be shooting that same Bighorn, exactly 20 years later, to try and kill my own turkey with it. We should have a fun time!